The community is coming together to help a 1-year-old boy who has been battling for his life after a serious car crash. The drinks, the music and the prizes were flowing inside Tommy Rockers Bar & Grill Saturday night to raise funds for #FightWyattFight. “It’s just such tragedy because he had his whole life ahead of him and we’re hoping he can have a fulfilling life,” Barbera Urgola, grandma. When he was 9-months old, Wyatt was serious injured in a crash in June in the Northwest valley , when the car he was riding in was t-boned. Wyatt’s parents were in the car at the time of the crash, as well. “When I woke up from blacking out and not hearing your son cry is the hardest thing that anybody would have to go through,” says Cole Schneider, father. Wyatt has been in and our of the hospital ever since, even celebrating his first birthday from a room inside UMC. 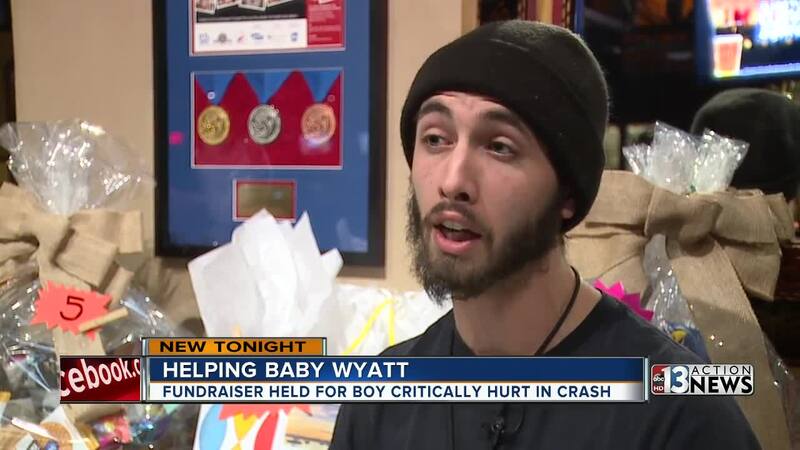 Wyatt has severe spinal injuries and breathing issues as a result of the crash. Saturday night, there was an outpouring of support to help Wyatt and his family get through this difficult time. “He’s just a rock star, he’s honestly where I get my strength from,” says Wyatt’s dad. Cole says the community coming out to help are more than just supporters, they’re family. Wyatt’s family has set up a GoFundMe page to help with some of the hospital bills.